Had the pleasure not only guiding Steve but helping him with the learning curve of finding new fishable areas. We started at sunrise while the wind was down but unfortunately the water was really high making sight fishing pretty tough. While learning technique and new areas to fish, I still like my clients to stretch a line when ever possible so we took our time working up a bank to a point that normally holds fish and today was no different. Steve made a perfect cast tight to the bank and started working a soft plastic jerk bait nice and slow when this upper slot redfish thumped it hard. 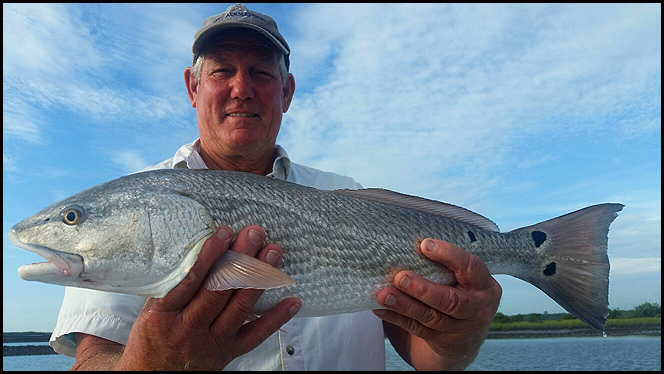 Steve made a one motion solid hook set which made the redfish take off peeling line while Steve held on tight. What does a fishing guide do on his day off? Goes fishing! Well scouting more like it but we still consider it fishing. Had the pleasure of fishing with local guide and friend Jim today as we set out from Bings scouting for our up and coming charters. We saw quality fish on every flat, oyster bars and drop off we know about that typically holds fish which put a smile on my face. Every so often we would encounter fish that just begged us to catch them so we did. Jim and I had 2 nice slot redfish slowly swim towards us after they gave up their location by crashing on a mullet minutes before. We both made 2 great cast resulting in 2 hooked fish that were quickly returned to the water to be caught another day. We continued finding small groups of fish milling around untill we stumbled upon a nice school of reds, we doubled up again. Our choice of lures was a gulp jerkbait and owner 5/0 weedless hook and I used a Zman paddlerz with a mustad weight hook. 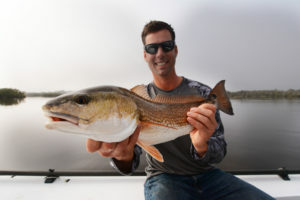 The bite is on fire right now and the weather is cooperating so give us a call and book your trip today! Spring is around the corner and should bring the mullet out of their winter hiding holes. 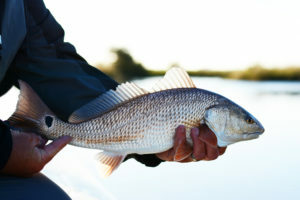 Redfish will start to scatter on the flats and will be hanging around the pods of mullet eating whatever gets kicked up. Look along Spartina grass edges, oyster patches during high tides and ICW and creeks for low tides. Slayer Penetrator 1/8 oz Predator jigs with a Slayer inc. sst paddle tail, Rapala skitter walk topwater plugs and hard plastic mullet imitators are proven lures that work for reds in March. 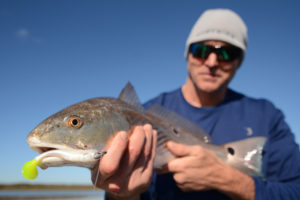 Live mullet, cut mullet, shrimp and popping cork combo or a mud minnow on a jig head will produce Redfish for the live bait fisherman especially during low tides in deeper creeks around oyster bars. Trout will be devouring top water plugs with the fish attracting sound of “Click Clack” at first light along ICW, creek mouths and docks on outgoing tides. Throw that plug far up creek in shallow water and “walk the dog” into nearby drop-offs where trout tend to hang out. When the sun gets high over head whip out that jig and soft plastic combo or diving plugs for subsurface trout. Bluefish will be around Matanzas Inlet mixed in with the trout at first light filling their bellies with soft plastic jerkbaits on ¼ oz jig heads. Later in the day Bluefish will feast on a live mullet on the bottom using a fish finder rig. 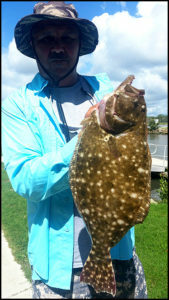 Look for Flounder at the inlets during change of tides using a fish finder rig and live mullet. Creek holes during low tides will hold Flounder as well and my favorite rig is a live mud minnow and Slayer 1/4oz Destroyer jig head. Keep your bait pegged to the bottom and retrieve it as slow as possible. If you think you’re going slow enough, stop and retrieve even slower till you feel that thump. Looks like the fan is on right now but its set to low during the morning hours. Best fishing has been around low tides even when the wind is cranking. Bait fish are starting their spring movement and the reds are hot on their tails so look for bait schools and you will find the redfish. A popping cork and live shrimp is a great way to find redfish during high water or when the bait is in the grass. Targeting points or grass banks with clumps of oysters usually a great place to use a popping cork. If the wind is low during first light start throwing a topwater plug. Book your charter today and enjoy your Palm Coast Fishing trip! Could have not asked for better weather for sight fishing redfish this morning! 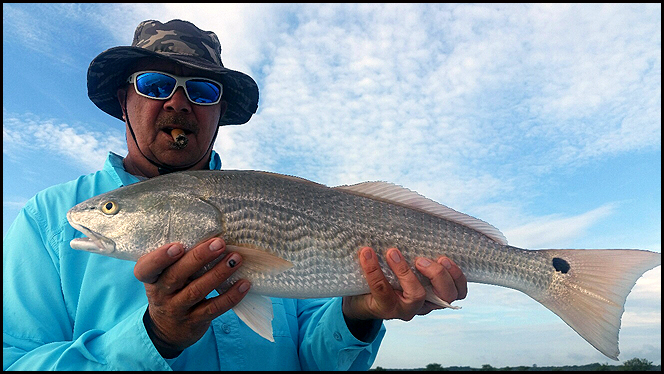 We were greeted by a bunch of tailing redfish at first light and Tom didn’t hesitate on hooking up with a beautiful upper slot redfish caught on a Slayer inc. paddle tail and 1/8th ounce jig head. 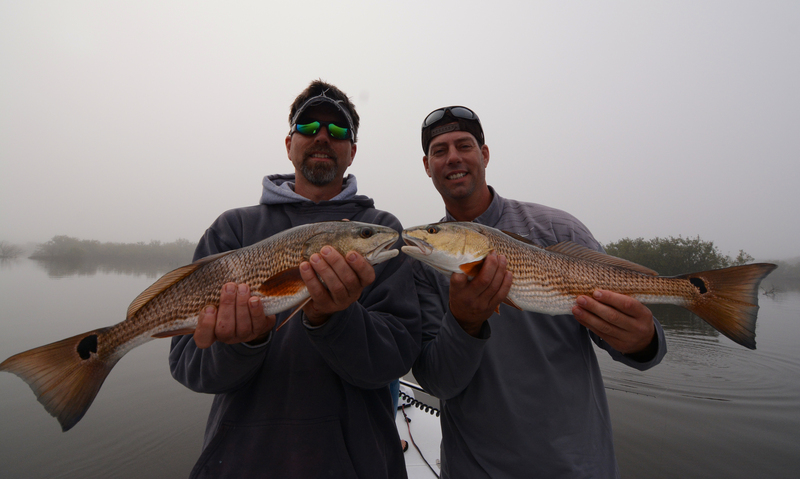 Book your charter today and enjoy a Palm Coast Fishing trip! 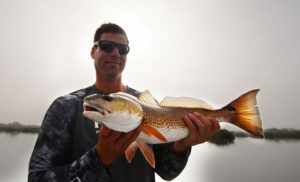 January and February are by far my favorite time of year to fish for redfish as it’s “sight fishing season”. It all starts after cold temps cool the water below 60 degrees which kills the brown algae that makes the water look “murky”. There are three major factors that play into a successful sight fishing trip, the 3 factors are Sun, Wind and Tides. Early morning starts are not a must as best times are between 10 and 2pm where the sun is at its highest peak. Not only is the sun a major factor to sight fishing but so is the wind. 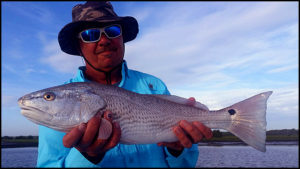 Windy days make sight fishing for redfish a bit tougher but a smooth glassy non windy day makes it as easy as it can be to see fish. 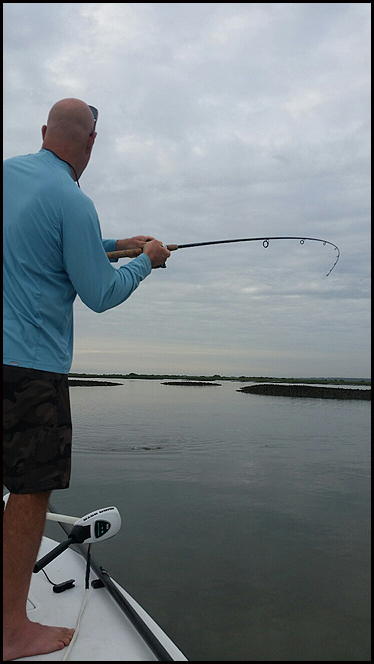 Tides is the last factor as you can catch them on both tides but low tides make it easier as fish get concentrated into shallow sloughs and troughs. 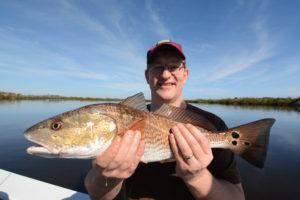 I prefer to fly fish while sight fishing with small shrimp patterns or small bait fish patterns but sight fishing is not limited to just fly fishing. 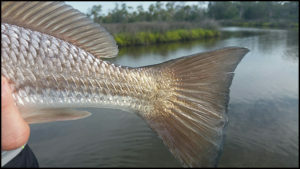 Small soft plastics like paddle tails rigged weedless or with a 1/8th ounce jig head will trick many redfish into eating. There is no other “tool” more important to sight fishing (other than what you are catching them with) than polarized sunglasses. Sunglasses come in many shapes and sized, lens color and materials, in my opinion the best for redfish is an amber or copper lens with frames that minimize the amount of light that leaks in from the sides. This has been the best summer weather that I can remember in my 14 years of guiding Palm Coast. For the past several months, we have been greeted with virtually glassed out conditions which help with reading the water. 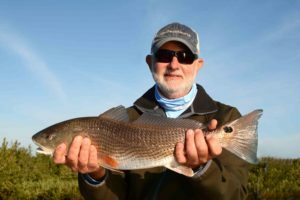 Poling the shallows quietly looking for signs of bait fish or redfish feeding has been our tactic to catch summer time reds. Depending on my Anglers ability, we target redfish on fly, lures or live bait. My go to redfish lures as of late have been watermelon/redflake soft plastic jerkbaits on a 1/8th ounce jig head, Rapala skitter walk topwater plug and gulp shrimp on 1/4 ounce jig head. Live bait has put most of the reds into my Hell’s Bay skiff since most of my anglers this time of year or novice or young kids. My go to setups vary on the tide stages and depth I am fishing. Last few days during the extreme high tides we have been experiencing I have been using a popping cork with a live mud minnow or finger mullet. I like to target submerged oyster beds, especially if bait present or grassy banks that come to a point. Beach water temps have dropped due to the thermocline (continuous west winds cause a thermocline) which pushed most of our migratory big tarpon away till waters rewarm but until then my anglers have been having a ball targeting juvenile tarpon. 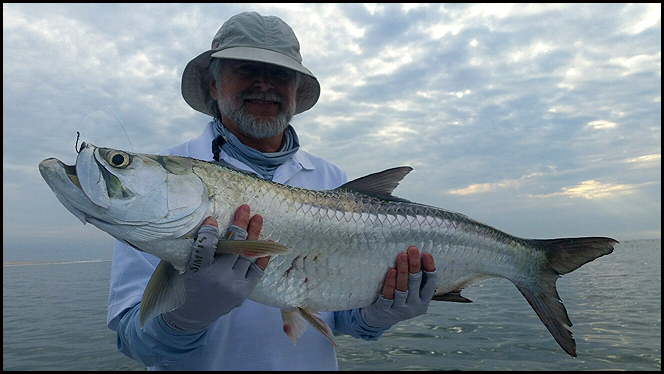 Learn how to catch juvenile tarpon here. Juvenile tarpon inhabit our waters year round but are most abundant during the summer. Another great week for my clients as we did well catching redfish and flounder out of Palm Coast. 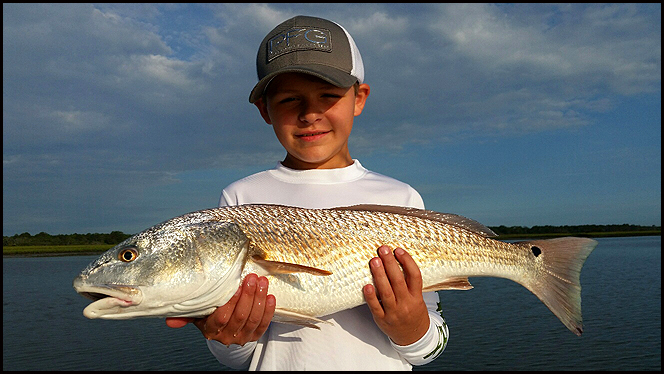 We fished the shallows for redfish and with the weather cooperating we had some good shallow water sight fishing opportunities. 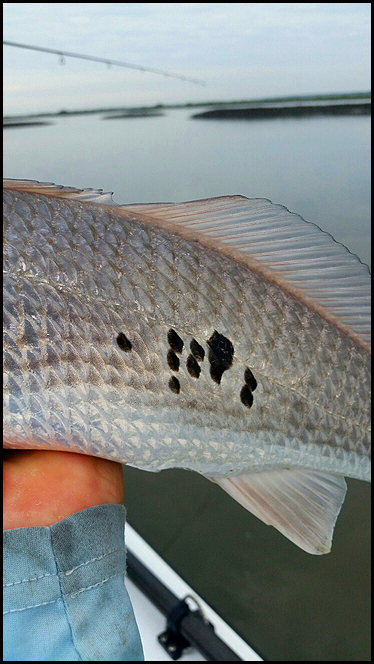 We saw redfish swimming with their backs out of the water and splashing in the shallows foraging on shrimp. Flounder this week has been more of a by catch while targeting redfish, although we don’t mind catching them especially for lunch. We have been blessed with some great fishing weather so far this summer season as we launch from Bings landing. Low west winds and great tides have produced a lot of sight fishing opportunities for my clients like Tom who landed some nice redfish on his resent charter. 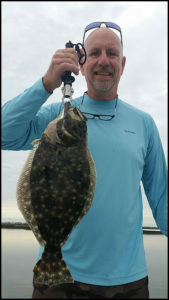 We have been catching some flounder as well like the one Chip is holding which was caught on a mud minnow and jig combo. 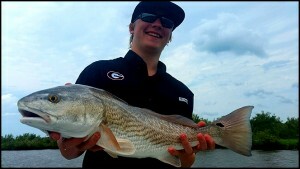 Our spotted redfish was caught using Slayer inc. soft plastic Jerk baits and weedless hooks sight fished in shallow water.